You Are Here: Home » Care, Love's Basic Requirements » Who Cares?! In our past few posts we’ve identified and discussed Respect as the first Basic Requirement of Love. Respect is a non-active mental formation or attitude toward self, toward another person or object. And now we add CARE. Because it is a basic requirement we can’t proceed to Love without it. If you/we don’t Care . . . done, case closed, no Love. CARE is the second Basic Requirement of Love, and it involves action…behaviors commonly associated with Love. CARE also involves a variety of reasoning, emotions or feelings beyond those of Respect. 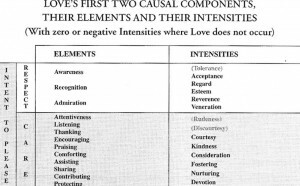 CARE can be loosely defined as “concern for,” however as a component of Love, CARE “can’t be said to begin until “intentful” action is initiated to fill real needs…” (The Technology of Love, page 43). This “intentful” action must be accompanied by an “impulse to take pleasing action,” simply expressed as the intent to please. So, CARE is really doing something with the intent to please. CARE, as with the other Basic Requirements of Love, has a range of intensities. At the minimal level we find Courtesy, and move upward all the way to the highest intensity of Devotion. At the zero level, below Courtesy, there is Discourtesy, with Rudeness as the negative intensity where Love cannot occur. We can begin to really understand why rude behavior always creates negative reaction and is destructive to love at all levels, within any relationship or even casual encounter with others. 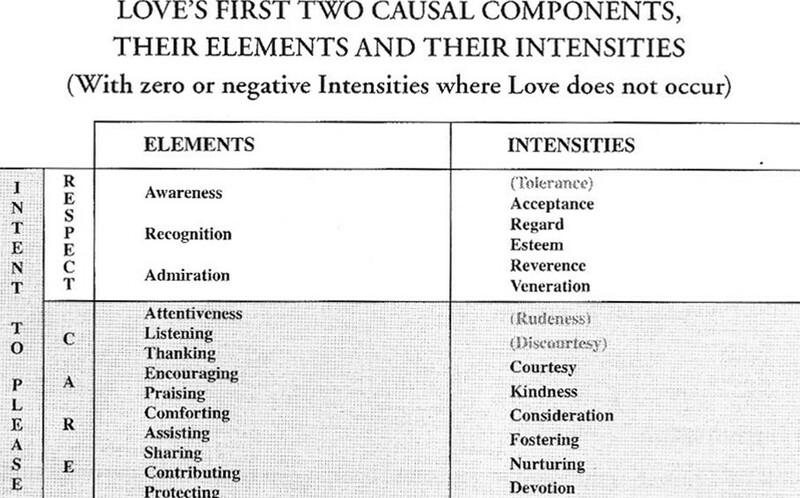 Chart from Technology of Love, page 72. Please listen to our podcast and join the discussion by posting your comments, questions, etc. 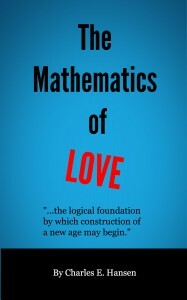 The information in these blog posts and pod casts pertaining to the Causal Factors of Love, the elements/vectors of Love their intensities and their organization are from the work, “The Technology of Love,” by Charles E. Hansen and are used with his permission. All copyright laws apply. 11 Responses to Who Cares?! Warning! Don’t Feed ‘em Fish!